WATCH: Sparks Fly In Holder, Gohmert Exchange On Capitol Hill : The Two-Way Rep. Louis Gohmert and Attorney General Eric Holder clashed over the House's decision to hold Holder in contempt in 2012. The exchange included finger wagging and warnings against lectures. Attorney General Eric Holder testifies before the House Judiciary Committee on the oversight of the U.S. Department of Justice on Capitol Hill in Washington, Tuesday. Sparks don't usually fly during an hours-long meeting of the House Judiciary Committee oversight hearing. "You don't want to go there, buddy," Holder said. "You don't want to go there." "I don't want to go there?" Gohmert replied. "About the contempt?" 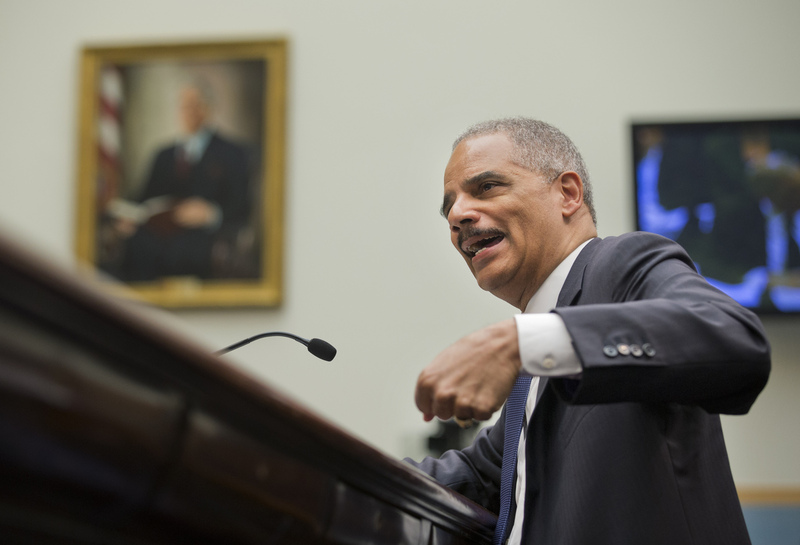 "No," Holder said, at this point waving his finger at Gohmert. "You should not assume that that is not a big deal to me. I think it was inappropriate. I think it was unjust. But never think that that was not a big deal to me. Don't ever think that." If you remember, the House voted back in June of 2012 to hold the attorney general in contempt over what Republican members said was his refusal to turn over documents about a gun walking scandal that has come to be known as Fast and Furious. Today, Holder went on to say that the contempt vote was "all about the gun lobby." Both of them said they did not want lectures from the other. After Gohmert's time was up, Holder muttered under his breath: "Good luck with the asparagus." This, The Washington Post tells us, is in reference to the last testy encounter the two men had after the Boston bombings last year. "The attorney general will not cast aspersions on my asparagus," Gohmert concluded to some confusion. The Language Log traced the idiom to a Three Stooges episode.